COSMOS is a program offered to high school students through the University of California. The highly competitive program sees students connected with careers in STEM fields. With the challenge of multiple campuses working on multiple systems, COSMOS knew they needed to move to a digital application system to replace their existing system. Inconsistent application processes were causing delays in reviewing. It was also lowering the completion rate of the application process. Having multiple programs and campuses was exacerbating the issue. In addition to having multiple steps and processes, there was an added complexity built into centralizing the reporting process to track success and impact. Rather than a stand-alone website, they needed a comprehensive web platform that integrated with their application system and portal. eResources worked with the University of California to create intercampus coordination. The stored data system, created by eResources, tracks and monitors students as they go through the application. Along with internal accountability measures, parents can also easily log on and track their students progress through the application process. This application system also consolidated the application review process. The COSMOS project now has uniform reporting and communication across multiple campuses and programs. 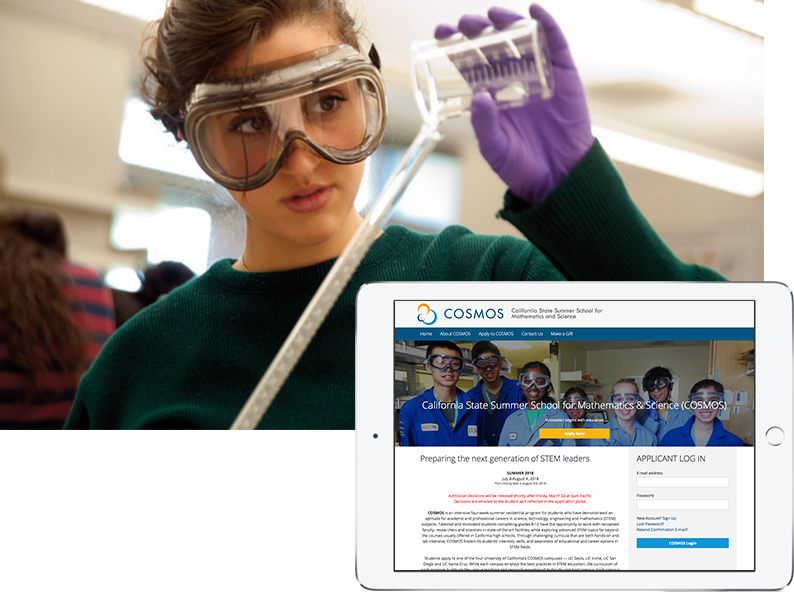 COSMOS is the University of California’s initiative to connect high school students to STEM fields. This project is a multi-campus effort that works with parents, students and educators to inspire prospective scientists, engineers and mathematicians. Per their website, COSMOS received over 3,500 applications for their program through the Orchestrate Application System. Selected applications were collected and assigned, based on the program, across their four campuses; UC Berkeley, UC Irvine, UC Santa Cruz, and UC San Diego. We couldn’t be happier with our decision to partner with eResources. The Orchestrate platform and application support have been everything we could have hoped for and more.